*The last day of the Dare to Imagine camp was great!! What a wonderful week with wonderful kids. And the best part was sharing with them about the love of Jesus, and letting them know how much God loves them. We already signed up to help out next year!! *I cried my way through the last few episodes of Blue Bloods this afternoon. It is such a good show. It reminds me a bit of West Wing, in that it is a hopeful show, with characters that show you how things could be, and you hope they are at times, whether it is the people running the White House, or the NYPD. *Around 5, Paul and I jumped on our bikes and rode down to the Silver Valley Farmer’s Market. I cannot rave about this enough!! The weather was pleasant last night, the music by CDA singer Robby French was great, and I got to visit with so many people that were also out and about. We bought some farm fresh eggs, a Kombucha Popsicle from a young entrepreneur named Radley, who even had his own booth this week. We bought some marinated mozzarella cheese and some garlic and sea salt cheese spread. I had a nice visit with Linn Mato Reese, who was selling 50/50 raffle tickets for the Shoshone Cancer Resource Center. We started off our time there getting big hugs from Erin Nansel, who momentarily left her post of pouring beer in the beer garden. We didn’t buy dinner there, but their food selection is expanding. The 1313 Club was selling pulled pork sliders. And there was another food truck there selling Indian Tacos and Nachos. If you have not taken the time to come and stroll through the market, put it on your calendar for next Thursday and enjoy a nice evening out in the Silver Valley. 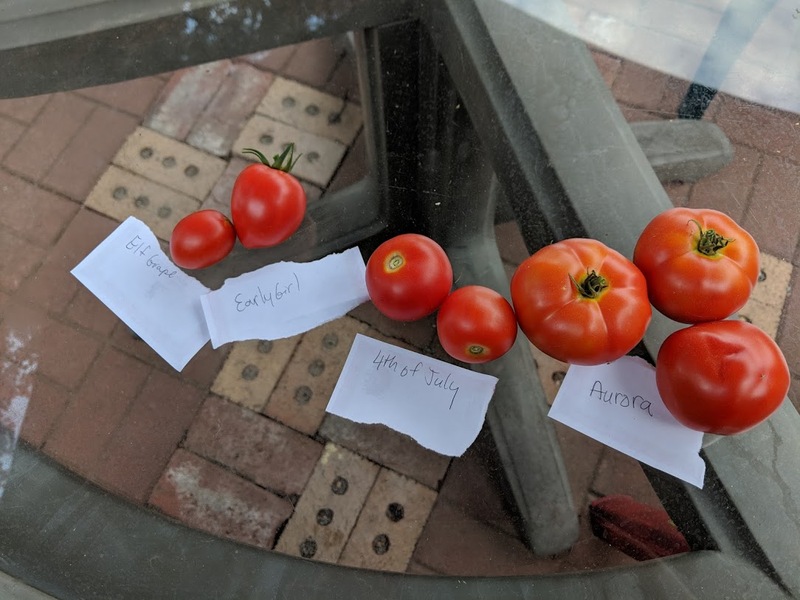 *We came home after the market and picked some tomatoes off our plants, and enjoyed our purchase of marinated mozzarella, grilled sausages, and we did a tomato taste testing. When I picked my first tomatoes, I didn’t pay attention what kind each tomato was that I ate. So tonight, I picked them, put them on the table and labeled them, so when we ate them, we could compare the tastes. They each had their own unique flavor, and they were all delicious.